In the eastern corner of Oregon, in the Gold Rush town of John Day, lies a building completely unique in the annals of American history: the Kam Wah Chung & Company museum. Constructed as a trading post in 1876, the Kam Wah Chung building was bought in 1888 by two Chinese immigrants, Lung On and Ing “Doc” Hay, who transformed it into a social, medical, recreational, religious, retail center. 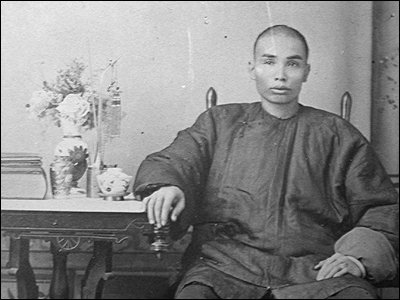 The company offered everything from pulsology consults and herbal medicine courtesy of Doc Hay, to labour contracting courtesy of Lung On, to Chinese newspapers, dry goods, a hot meal and a bed, games of Go, an unofficial post office for communications with China, and an opium den in the kitchen. Ing Hay’s practice covered wide areas of Oregon, Idaho, Washington, and Nevada and through his mail order service, even more distant places. He saw patients in person either through office visits or house calls. Patients also wrote to him describing their symptoms and he diagnosed the illness, sent the herbal remedy with detailed instructions on what to do, and continued the correspondence until the patient was cured. Once he concocted a brew with over 83 different herbs to cure a man suffering from swollen feet. He probably inherited a customer list from the previous herbal doctor known as Kam Wah Chung. Newspaper articles, diaries, and letters testified to his success. He saved the lives of all his patients in the 1915 and 1919 flu epidemics in eastern Oregon, allegedly cured cases of meningitis, and saved a person’s limb from being amputated by a western physician. 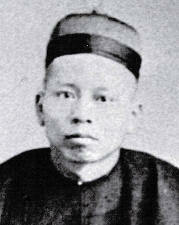 There were many such centers in the American West, thanks to the 19th c. influx of Chinese immigrants, but what makes Kam Wah Chung unique is that it is a virtual time capsule. When Doc Hay became ill and left the premises in 1948, the building was boarded up and left completely alone — no vandals, no treasure hunters, not even any teenagers making out — until it was rediscovered in 1967, restored and opened as a museum in 1976. Everything that was in that building in 1948 is still there. Every herb, every tin of morphine sulfate, every altar to the gods, every book, every business invoice, every love letter. A high wood counter with metal boxes and shelves below is along the south wall, and shelving containing cigar and metal boxes, and bags of herbs line the entire north wall. Each box or tin is labeled in Chinese characters. A high shelf above the exterior window on the east side is lined with bags of herbs. Several items are on the counter: vials with remedies, a mortar and pestle for crushing and mixing, scales and weights used to measure the herbs, a Chinese abacus, and a coffee grinder to grind the herbs. Jars and vials on the counter contain items such as a rattlesnake, turtle, and powdered morphine. A bear paw also sits on the counter top. There are approximately 500 herbs and medications found in this room; to date about 250 have been identified and recorded. A small sampling of the medicines and herbs (common names) include wild asparagus, cocklebur, dwarf flowering cherry, clove, chicken gizzards, cardamon, citrus (orange), red pepper, tortoise shell, tiger bone, croton, caladium, summer cypress, onion, astor bean, bamboo, ginger, and pomegranate bark. Again, this collection is completely unique in the United States, and judging from the Chinese visitors who have commented on it, there’s no historical collection like this to be found in China itself either. I could quote the whole pdf because really every nook and cranny of this building is crammed with amazing stuff, but I’ll stop here and just suggest that y’all take a look at the document yourselves to get a full sense of what a treasure trove Lung On and Doc Hay left us. 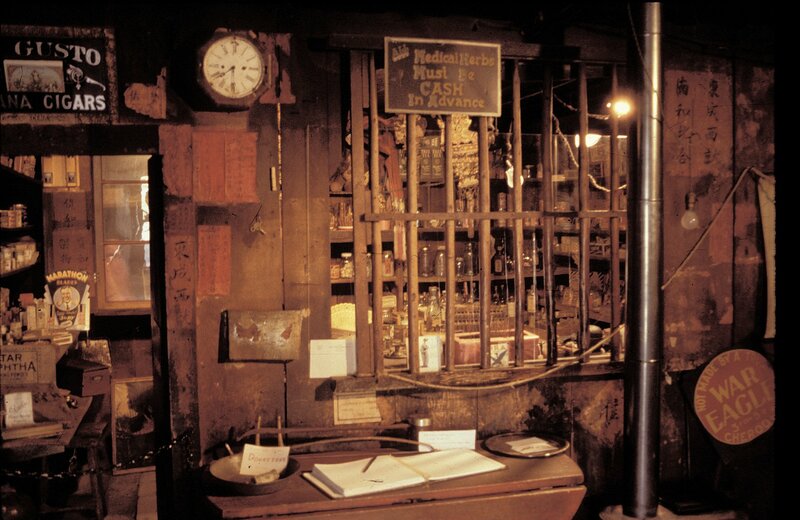 To visit the Kam Wah Chung & Co museum is to step back in time and immerse yourself into the lives of Chinese immigrants in turn of the century America. It’s a one of a kind opportunity, one which I will most certainly avail myself of should I find myself Oregon way. This entry was posted on Tuesday, April 29th, 2008 at 8:27 AM	and is filed under Modern(ish), Museums, Treasures. You can follow any responses to this entry through the RSS 2.0 feed. You can skip to the end and leave a response. Pinging is currently not allowed. Thank you, thank you, thank you for bringing this to our attention. This is truly an incredible find. It’s very good to see that the ancestors of Lung On and Ing “Doc” Hay protected the building from vandals, looters and horny teenagers. Like yourself, if I am every in Oregon, I will have to visit this site. The history of the Chinese in America is one that I certainly don’t know enough about and one that is hardly ever touched upon in school or the mainstream media. This site is especially amazing when one considers that the Exclusion Acts severely curtailed Chinese immigration. Any remaining artifacts or sites are of precious values because there were so few Chinese in America until the Act was lifted. Again, thank you for this wonderful entry. I’m thrilled you’re thrilled. As soon as I came across the museum during a random websurf, I knew I had to write an entry about it. I can’t help but think of Lung On as a sort of Mr. Wu, only without the negatives like the lacist language difficulties and the, you know, murderousness. That’s way cool. They need some decent high res pics, though.